What are the best holiday safety rules for decorating awnings? Happy holidays! It’s time to get your Christmas decorations up and safely enjoy the holidays. We are here to provide you decoration ideas and teach you how to safely hang Christmas lights on your residential awnings. The art of hanging Christmas lights may seem easy but it’s a tricky task, especially when there’s snow and ice outside. To properly hang Christmas lights on your awnings, you will need holiday lights, awning hangers, a pair of good pliers and measuring tape. Before you get down to business, you need to identify how many Christmas lights you will need to cover all your residential awnings. This is where the measuring tape will come in handy. You should always plug together all your Christmas lights prior to hanging the items on your awnings to make sure all the light bulbs work. For safety, inspect all the light strings to confirm there are no breaks or damages. Next, use the awning hangers on the front of your awnings (you can slide the awning hangers to accommodate your string of Christmas lights). It’s recommended that you give 10 inches of space between strings of lights on awnings. Holiday decorations on your awnings will make your home more inviting to guests and add extra warmth. It’s best to use lightweight Christmas lights to adding too much extra weight to your awnings. After the holiday lights are up, you can focus on adding garlands, bows, Christmas wreaths and holiday stockings to your awnings. To attach these holiday ornaments up on your awning, we recommend using suction cups. If you are feeling extra festive, you can add Christmas toys to your awning. When you are looking for convenience, you can forget about the Christmas lights and other ornaments. 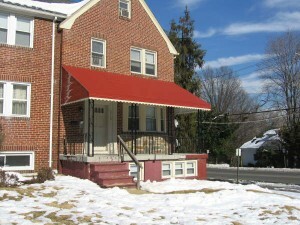 You can use custom awnings that offer you the option to change awning fabrics throughout the year. Here at Carroll Awning Company we are here to tailor awning fabrics to make your holiday decorations ideas come to life.